Social listening and social monitoring are often used interchangeably, but they don’t quite mean the same thing. 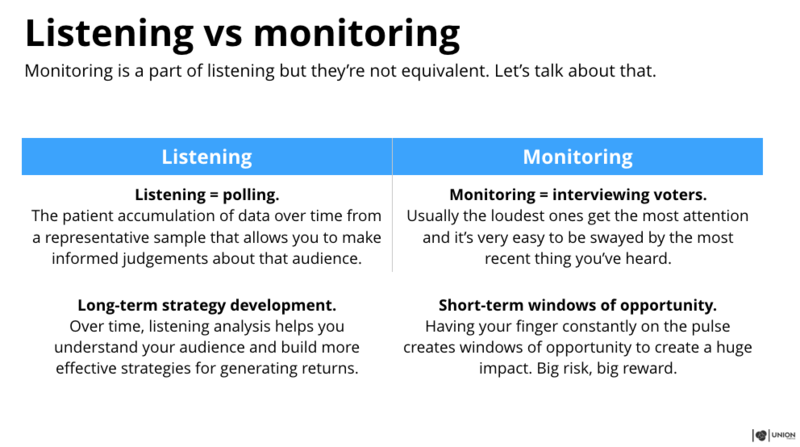 So what’s the difference between listening and monitoring? Why are they important? How can they keep your brand healthy and connected with your audience? Social listening is paying attention to the conversations that matter to your brand across social media. That includes brand mentions in all forms, conversations about your competitors, industry keywords and more. It’s a powerful tool to turn conversations happening on social media into valuable input for your marketing strategy. How are listening and monitoring different? Monitoring your brand on social media means that you’re keeping track of direct mentions of your brand so you can respond to them. This includes anyone directly tagging your brand or mentioning it in conversation. This is usually the first step in setting up in your social monitoring – being sure you’re monitoring all mentions of your brand, products and key employees. Social listening takes things a step further, expanding to broader conversations around your industry, competitors and your target audience. This is a more strategic activity, and should inform your social marketing plans for the future. From the webinar our CEO recently did on social listening. Get the full presentation here. 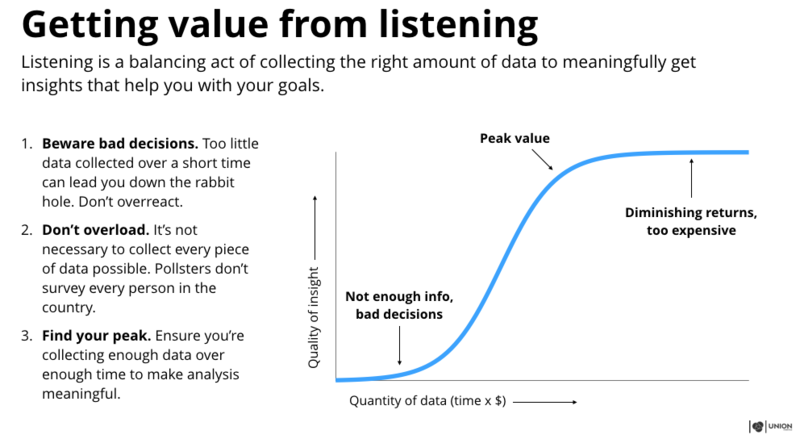 Listening is a balancing act of collecting the right data to meaningfully get insights that help you with your goals. How does social listening help my brand? You know people are talking about your brand on social media. You should be paying attention to these conversations. Don’t go in with the intent to control the conversation, since that’s impossible, but try to understand the needs and wants of your target audience and how you can best provide value to them. Social monitoring is going to give you the most direct feedback with people intentionally naming and reaching out to your brand. Listening will take it further, allowing you to potentially understand the reasons behind the statements being directly made to your brand. You can identify shifts in your industry and adapt as needed, not to mention tweaking your campaigns as needed with ongoing, real-time feedback to work from. How do I set social listening up? Don’t let setting things up be a daunting task. As we’ve mentioned, we’re here to help! At the most basic level, you want to start with key terms for your monitoring: your brand handles across social and any branded hashtags you use (including common misspellings of either), plus any you might be running in a specific campaign. The next important step would be keeping an eye on your closest competitors. From there expand along with available resources to what else is relevant: key industry terms, influencers you might want to keep an active eye on, other competitors, and more. For more information, you can catch a recording of our webinar on social listening here. And if you want help setting all of this up- including figuring out exactly what you need to be tracking- we can do that! Drop us a line or click on the button below. We can help you monitor exactly what you need, no matter your resources.